Solomon’s Lodge was originally chartered on November 13, 1812 under the Grand Lodge of Free and Accepted Masons of the State of New York. At that time the lodge was numbered 209 and met in White Plains. In 1821 the lodge moved to Tarrytown and for many years was the only active Masonic lodge in Westchester County bordering on the Hudson River. During the persecutions of the Anti-Masonic Period the lodge ceased to operate, and the Grand Lodge declared its charter forfeited on June 7, 1833. In 1849, Solomon’s Lodge was revived as No. 18 under St. John’s Grand Lodge, a rival body to the Grand Lodge of New York. 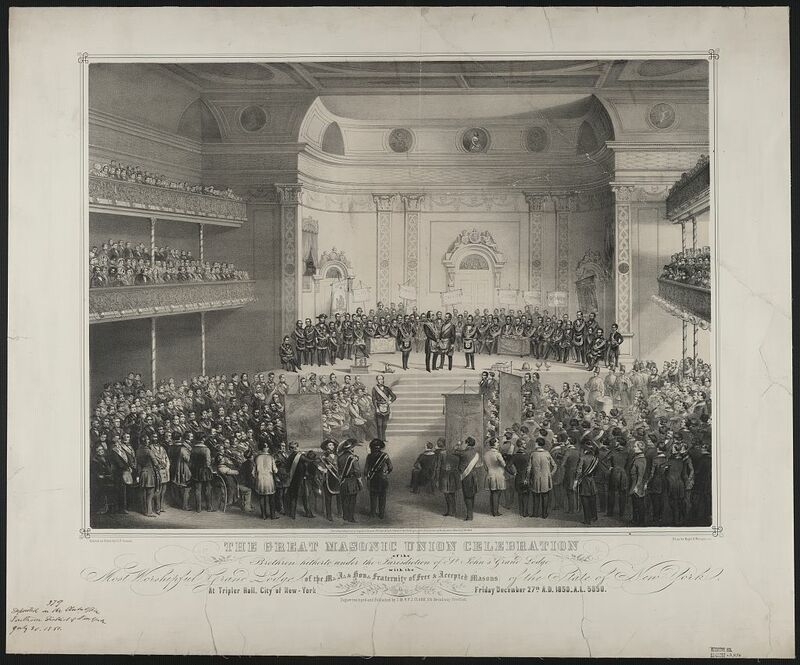 On December 27, 1850, St. John’s Grand Lodge united with the regular Grand Lodge at a Grand Masonic Union Celebration held in Tripler Hall in Manhattan. The above lithograph of the celebration by Charles Crehen was based on a daguerreotype taken at the event. The scrolls piled on the table on the right side of the stage are the new warrants being granted to the former St. John’s lodges. One of them now hangs on the wall of our lodge room. Solomon’s Lodge owns and meets in the Tarrytown Masonic Building, also known as the Vanderbilt Building or the Corporation Building, built in 1897. The building has a custom-designed room on the third floor for lodge meetings. Four other lodges and the district’s Masonic Charity Corporation also meet in the building. In December 2000, Solomon’s Lodge celebrated the 150th anniversary of its reunion with the Grand Lodge of New York. The Lodge struck a special medallion for the event designed by members of the Lodge. The medallion prominently features the Ride of the Headless Horseman from the Legend of Sleepy Hollow, a nearby town. A Masonic emblem and an unbroken chain surrounding the scene complete the design. Since 2000, the design of the medallion has been adopted by the lodge as its emblem. In December 2010, the Lodge held its historic 4000th Communication.